A NEIGHBOR CLIMBED ON THE FENCE AND SAW THE CHILD BEING FLUNG AROUND BY HIS LEG. THEN HIS BODY ROLLED OVER ENOUGH FOR HIM TO SEE THAT HE WAS DISEMBOWELED. 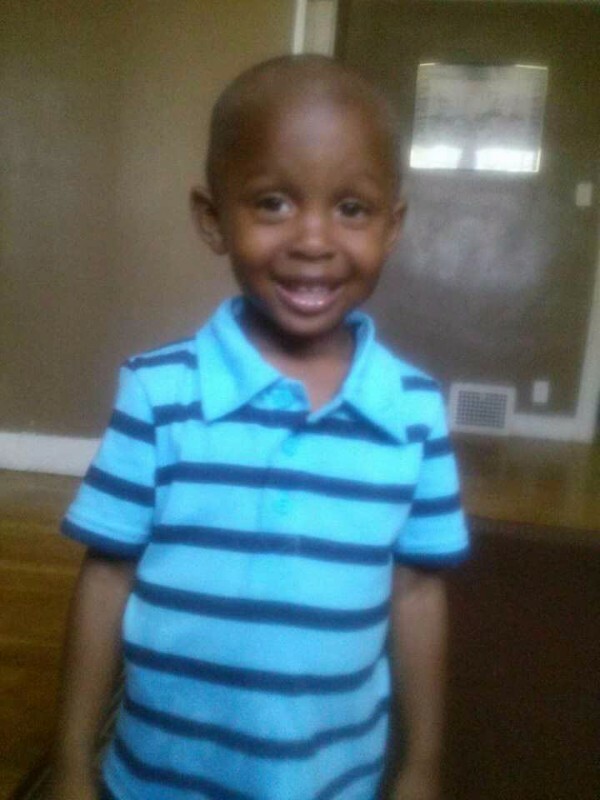 DETROIT, MI - A 4-year-old boy, XAVIER STRICKLAND, died Wednesday hours after he was snatched by pit bulls while walking with his mother along a residential road near the Lodge Freeway in Detroit about 12:30 p.m. Wednesday. The dogs dragged the child up a short driveway and under a gap in the fence back and into their yard. They proceeded to viciously maul him for several minutes while neighbors tried to break through the gate. Others grabbed bricks from nearby lots to try and scare off the animals, one neighbor said. Detroit police arrived quickly, within five minutes according to multiple accounts, and entered the backyard of the home on Baylis along the Lodge Freeway. They immediately opened fire and killed one of the canines. Two pit bulls escaped into the neighborhood. They were subsequently located and fatally shot by police, said Detroit Police Lt. Pride Henry. Police immediately transported the boy to a nearby hospital in a Detroit police car, according to Henry. He did not know the condition of the child or his mother as of 2 p.m. Wednesday. Detroit Police Sgt. Cassandra Lewis confirmed the boy died of his injuries some time prior to 4:30 p.m. She could not confirm if the dog owner had been arrested and said the investigation is ongoing. Henry said the homeowner was inside during the attack and questioned afterward. UPDATE: A 4-year-old boy is in critical condition after being mauled by multiple dogs Wednesday in the 15500 block of Baylis Street in Detroit. The child was walking down the street with his mother when the neighbor's dogs attacked. Witnesses told Local 4 the dogs dragged the toddler under a fence. Police shot two of the dogs and were able to capture them. However, there could be more dogs on the loose. (WJBK) - Detroit police say a young child has been mauled by a dog on the city's west side. It happened in the 15500 block of Baylis Street, which is near Linwood Street and M-10. A source tells FOX 2 the 4-year-old was taken to the hospital in critical condition, and that as many as three dogs may have been involved. Detroit police tell FOX 2 at least one of the dogs, which they believe at this time belonged to a neighbor, has been shot. 29. 11-12 - ANTHONY RIGGS - 57 - FAMILY MEMBERS DESCRIBE HIM AS A DOG LOVER AND HE HAD HAD MANY LARGE DOGS BEFORE - HE HAD ADOPTED THIS DOG SAID TO BE A ROTTWEILER ABOUT 3 HOURS EARLIER - IT ATTACKED HIM IN HIS HOME AND ATTACKED OTHERS AS THEY TRIED TO COME TO HIS AID - THE DOG WAS FINALLY PUT DOWN. 30. 11-15 - CARTER EVAN HARTLE - 11-M0NTHS-OLD - MARSHALL NY, THE DOG IS SAID TO BE A PIT BULL/SHAR PEI MIX NOW - THE MOTHER SAYS THE BABY WAS IN THE LIVING ROOM WITH HER 3 OLDER DAUGHTERS PLAYING WHEN SHE TURNED AWAY TO DO SOMETHING, THEN HEARD THEM ALL SCREAM AND THE DOG HAD THE BABY BY THE HEAD AND NECK. 31. 12-2 - XAVIER STRICKLAND - 4 - DETROIT MI - THE CHILD WAS WALKING DOWN THE STREET WITH HIS MOTHER WHEN 4 PIT BULLS ATTACKED HIM AND DRAGGED HIM BACK UNDER A FENCE. What an absolute revolting, horrible, despicable, nightmare! I can't even believe this poor child was snatched from his mother, and ripped apart by pit bulls. The breed that is so misunderstood, by nutters. This is too upsetting, I can't even think straight. Can we have BSL yet? Is it okay to get rid of this breed NOW? If not, WHEN? These baby killers got out on a regular basis. The death of this poor boy is at least manslaughter, IMO upped to murder to by criminal negligence and depraved indifference. As a mother, even though my kids are pretty much grown, I can remember the terror and panic that I felt when something happened to my kids. It was never anything serious, thank whatever gods are in charge of small children, but there are always falls and bumps, and any kind of head or face trauma spouts a lot of blood. And you can always imagine what could have happened. But this. This. Those monsters that you told your children don't exist. They do. And people keep them as pets and defend the monster's right, not only to exist, but to attack and kill. I do not understand why there is even an argument about this. I have never heard a reason or an excuse that can make having your child ripped from your arms, dragged into the monster's lair, and then disemboweled ok. I hope that the mother is not reading the stories about this attack. Or the comments by the nutters. The details need to be out there, because there is this argument as to whether or not these monsters should live among us. People need to know. But I want to hold the mother in my arms and protect her from all of this. To tell her that he didn't suffer, and that everything is going to be ok. Because, for her, this nightmare is her life, and there is no waking up.